I’ve found copies of my old gas price spreadsheet. Now I have a history of the Indiana gasoline prices from Nov. 2003 to Dec. 2015. One of the reasons I wanted to find the data is to show the cliff. Between Oct. 8 and Nov. 7, 2008 the price of gas here dropped 40%. Online sources show that the price of crude oil dropped rapidly in that period, but not as rapidly as the gas price in Indiana. 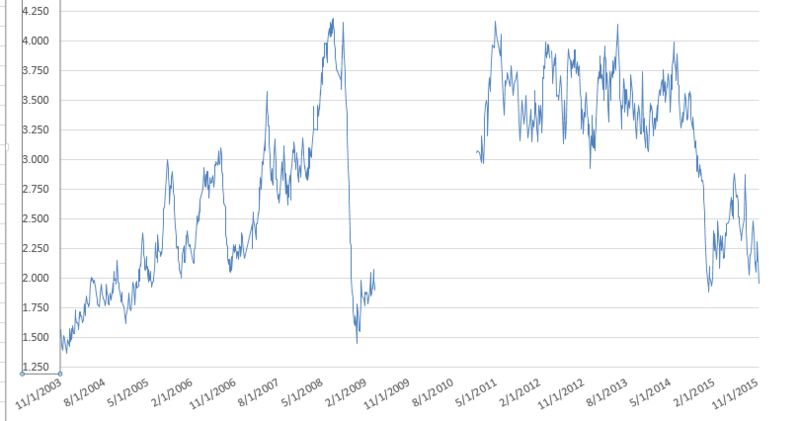 I’m still looking for data from the 20 month gap in 2009 and 2010.